This program covers the art and luxury management sector with a focus on France and its cultural excellence. Taught in English, this program explores the management, sales and distribution of luxury products using the themes of taste and luxury à la française from Louis XIV to present-day France. Themes covered include the French arts de la table, fashion, gemology, cosmetics and fragrances, interior design, furniture, art objects and design, scenery and décor, etc. 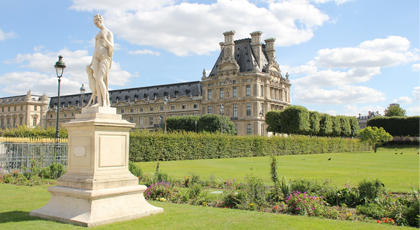 The innovative academic program combines lectures with practical field visits major historical monuments, fashion houses, and workshops that represent French cultural excellence. Legal aspects, finance, luxury marketing and management, communication and strategic marketing are all taught by professionals. Direct interaction with industry players will allow students to build up a network of top professionals in the field and discover the savoir-faire of different sectors. The year is made up of 3 terms:2 terms of classes (Oct-Dec/ Jan-March) and a term of professional experience in the form of an internship (April-June). During the last two terms, students will work on a personal project that they will be expected to present in front of a jury in order to validate their certificate. Each trimester consists of 200 hours of classes spread out over a 10-week period. Courses are taught in English. Participants are attributed a mentor for personalized coaching as well as group methodology sessions to guide them in the conception and realization of their personal project. 3rd Term: full-time internship along with methodology sessions and personal projects. This program aims to develop professional skills for the luxury sector. Interest in business and thorough knowledge of art history are essential prerequisites.